HomeHomeStaphyt celebrates its 30th anniversary! From 11th to 13th December 2018, the European teams of the Staphyt group met at a seminar in the South of France. An extraordinary event to celebrate the 30th anniversary of the company and launch the new strategy that will guide our projects and motivate us. For more than 350 employees of 17 nationalities, it was the opportunity to meet around common values, to exchange to get to know each other better and strengthen links. 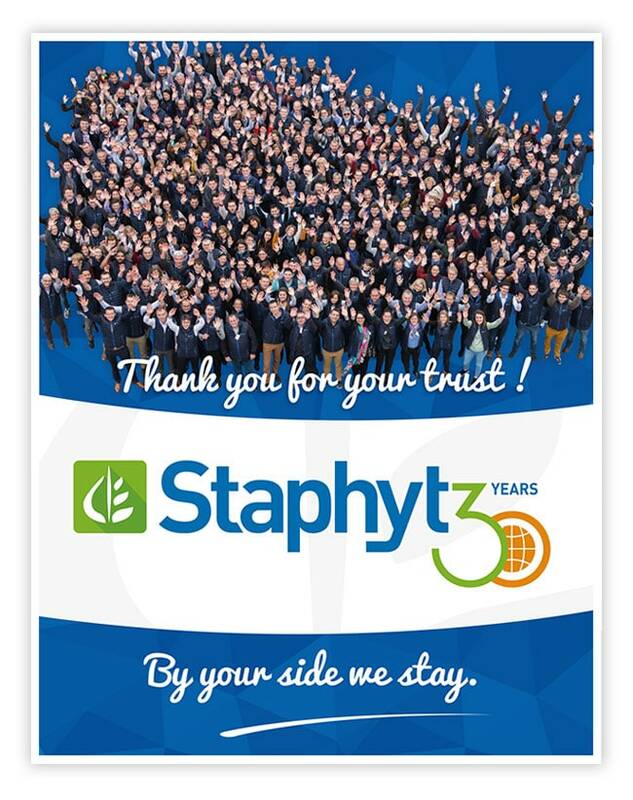 On 14th of February 2019, Staphyt will celebrate its 30 years of existence. 30 years during which ones our company has grown, while preserving its professionalism, quality of service, good financial health and the autonomy of a family business. In a complex and changing environment as today, we are constantly adapting to remain agile, efficient and innovative. That is why we develop 3-year strategic cycles. In 2019, we focus our new strategy on the full satisfaction of our clients and our teams, based on human values which are important to us. We believe in the freedom form company that places its people at the heart of its functioning, sharing skills and know-how. Each of us has an important role within the company. We want to give our teams perspectives, motivating jobs, resources and a friendly working environment. Thanks to a growing, qualified, committed and multidisciplinary team of experts, we can remain always and everywhere by your side. Staphyt is a sustainable partner you can rely on for your future development. In 2019 “Staphyt is 30 and has everything to succeed” and it is through a strong partnership with our clients that we intend to make this success happen! We wish all our clients and partners a successful and productive year!